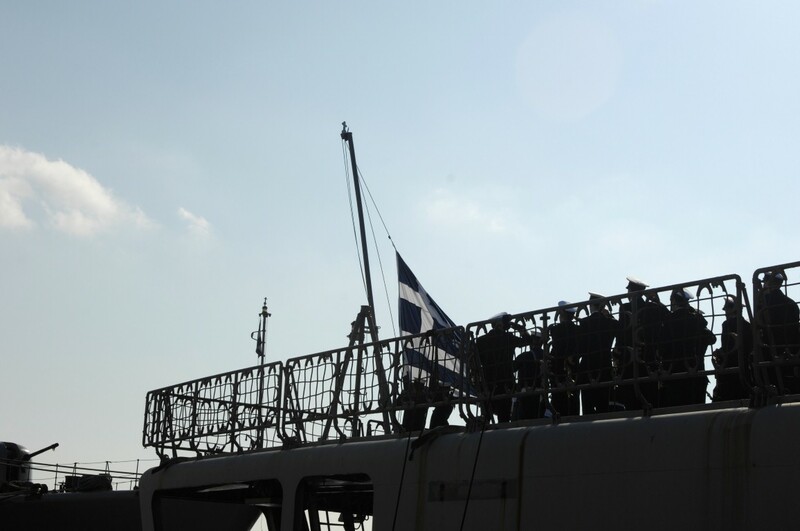 Lowering of the Greek flag on Boubolina. Photo: Official Hellenic Navy Photo. Today Greek Nay decommissioned one of her 10 Elli lass frigates F-463 Bouboulina with a solemn ceremony. Like all Elli class ships the ex Bouboulina started her life in the Dutch Navy. At that time she was known as Pieter Floriz. She was transferred after 18 years of service in Royal Netherlands Navy. She was commissioned in Greek navy in 2001 where she spend about 1,200 days at sea, covering a total of more than 148,000 nautical miles. Greek Navy conducted a mid life modernization to six of the ten ships in service. Bouboulina, Kanaris, Themistocles and Nikiforos Fokas which were not modernized are going to be decommissioned gradually. Her hull will be probably used to supply parts for the remaining 9 ships of the same class.